The S&P 500’s 3.3% drop on Wednesday (10/10) leaves the index down 4.4% month to date already. Below is a look at our updated Bespoke sector trading range charts to see what’s left in the rubble after a truly horrific start to the month for stocks. The light blue shading in each chart represents each index’s “normal” trading range, which is one standard deviation above and below the 50-day moving average. Moves into the red or green zones mean the index has gotten “overbought” or “oversold.” An “oversold” reading means price is more than one standard deviation below the 50-DMA, and vice versa for an “overbought” reading. 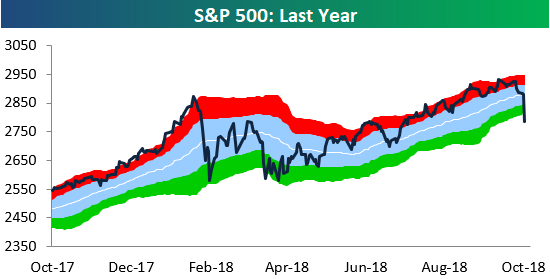 After yesterday’s drop, the S&P 500 has reached its most oversold level since the end of the first quarter when the index successfully re-tested its February correction low. 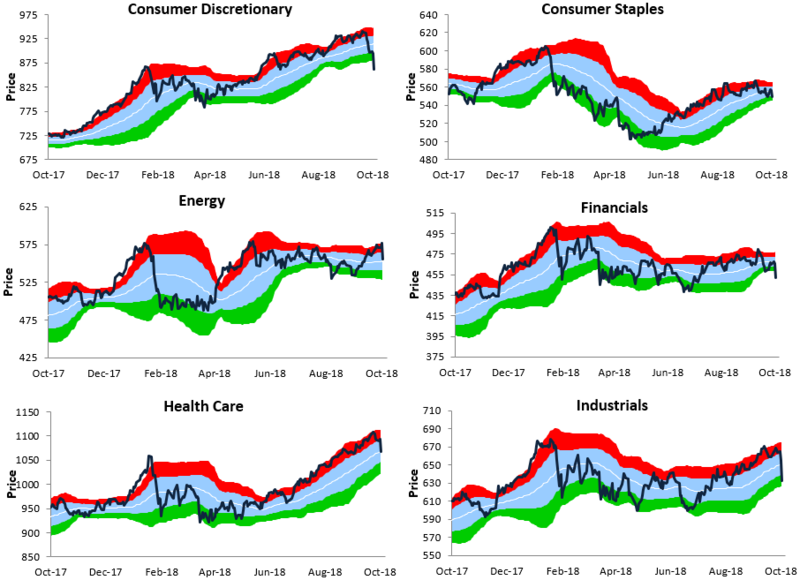 Looking at individual sectors, a number of them broke down badly yesterday and are now trading at or close to their most extreme oversold levels of the last year. These include Consumer Discretionary, Materials, and Technology.